The author of the idea: udrya, the mq5 code author: barabashkakvn. Martingale based Expert Advisor specially designed for small deposits. This feature is enabled through the configurable parameter "Number of bars to be skipped", which means skipping the specified number of bars after the last entry. This load can destroy small deposits. Our EA with "Number of bars to be skipped" (let it equal 3) would open the first BUY 0.01 position, skip three bars and open the second BUY 0.02 position. 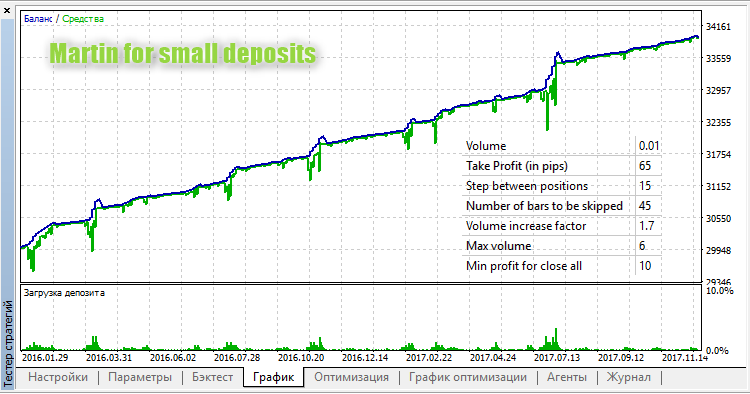 Min profit for close all - minimum profit, at which all open position should be closed.